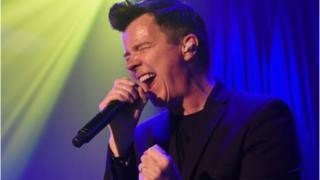 Rick Astley's comeback album has been nominated for album of the year at the BBC Music Awards. Astley's 50 gave the singer his first UK number one for almost 30 years. It will compete for the BBC Radio 2 album of the year award with Adele's 25, Coldplay's A Head Full of Dreams, ELO's Alone in the Universe and Michael Kiwanuka's Love & Hate. But there is no place on the shortlist for David Bowie's Blackstar, which came out days before his death in January. The nominees were chosen by the Radio 2 playlist committee. The winner will be announced at the BBC Music Awards on 12 December. The shortlists for other categories, including BBC Music British artist of the year and song of the year, will be announced shortly. Bowie was nominated for British artist of the year at the inaugural BBC Music Awards in 2014, but lost out to Ed Sheeran. Rick Astley has enjoyed a successful comeback this year, but if he wins the BBC Music Award it will be far from his first taste of awards glory. In his first flush of fame in 1988, he won best single at the Brit Awards - as well as worst dressed person in the Smash Hits Readers' Poll. And, more improbably, at the height of the Rickrolling phenomenon he was voted the best act ever at the MTV Europe Music Awards in 2008. To be eligible for the BBC Music Award, albums must have been released between 17 October 2015 and 16 October 2016.